Rosemarie Pendon, 24, lives in Lagro, Quezon City and has mobile broadband sticks from three different telecommunications networks (telcos) but none can provide a sufficient signal for her to connect to the Internet while inside her home. “With Smart and Globe, you have to go outside of the house to get a signal. For Sun, there is no signal even if you go out of the house,” Pendon said in an interview with Inquirer.net. “Our neighbor has PLDT WiFi which I sometimes connect to but its still slow,” she added. Dennis Garcia, 29, cannot get a sufficient network signal in his home province of Nueva Ecija even when he goes outside of the house. “The broadband stick that I bought was useless,” he said. Pendon and Garcia are a couple working in Dubai, United Arab Emirates who are in the country for a short vacation. Pendon is an assistant manager in a cafe while Garcia works as a web journalist for one of UAE’s online news agencies. “In our cafe in Dubai, during busy nights with events, as much as 80 to 90 people could be connected to the WiFi network and the Internet connection will still be fast,” Pendon said. “When you go to malls, their WiFi Internet is very strong. You can really use your phone just for calls, which is also cheaper than text messaging,” she said. The cheapest Internet broadband subscription in Dubai is 110 Dirhams per month ($29.95), which Garcia said he has in his apartment. “Even if the price there and here are nearly the same, the speed there is very different than here,” Pendon said. 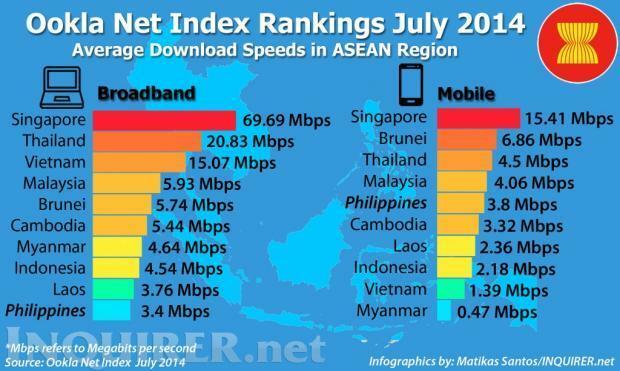 Both could not help but accept the sad fact of the slow Internet in the Philippines, which has the slowest average speed in the Association of Southeast Asian Nations, according to the crowd-sourced Net Index rankings by Internet broadband testing company Ookla. President Benigno Aquino III acknowledged this in a speech at the opening of the Convergys San Lazaro branch in Manila on Sept 3, 2010. Ten months later, President Aquino issued Executive Order No. 47 which placed the CICT under the Department of Science and Technology and renamed it the ICT Office. The DOST also unveiled a five-year Philippine Digital Strategy which was formulated by the CICT. The PDS’ major thrust are e-Governance, Internet access for all, digital literacy, and ICT sector development. Each of these has a set of objectives for 2016 and a set of corresponding actions that respond to these objectives. “It is an ambitious but doable strategy with success hinging on strong cooperation between different ICT sectors for its implementation,” Montejo had said. Angela Maravilla, a Client Solutions Manager of virtual office service provider vOffice Philippines Inc. in Bonifacio Global City, said that she apologizes to their clients when they complain about intermittent Internet connection. “There are times when all our meeting rooms are fully booked, then the Internet really slows down. Somebody complains and we have to reset our connection and I just apologize,” Maravilla told Inquirer.net in a separate interview. “Although it’s not reason enough, it’s in our contract that we should provide fast and reliable Internet. Sometimes it’s inevitable that the Internet connection will slow down because of many people connecting at the same time,” she said. vOffice offers office services such as phone answering, reception, meeting room facilities, and free WiFi, to small and medium enterprises who find the cost of establishing a physical office too restrictive. The company started June 2013 in the Fort Legend Tower with around 50 clients that are mostly freelancers and consultants. They had more than 1,000 clients by the end of 2013 prompting the expansion of a second business center in One Global Place Tower also in BGC. vOffice has 25 business centers throughout the world including China, Vietnam, Australia, Hong Kong, Malaysia, Indonesia, Thailand and the United Kingdom, but Albert Goh, founder and CEO of vOffice Philippines Inc. said that Internet in the Philippines “certainly ranks among the most expensive” in relation to the speed and reliability offered.